Detroit Speed front coilover conversion Kit for the 2016-2019 Camaro SS provides bolt-on replacement aluminum strut assemblies that are fully adjustable. The adjustable spindle bracket allows ride height to be adjusted without affecting strut travel as well as easy spring changes. 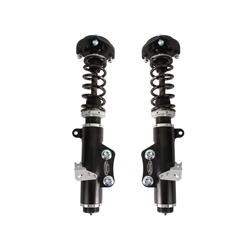 The ride height can also be "fine-tuned" with a coilover adjusting nut on the strut body. In addition, the Detroit Speed strut can achieve more negative camber than the OEM strut. The upper strut mount is replaced with a precision spherical bearing to eliminate compliance and improve response. In addition, the upper mounting plates offer Speed-LIGN™ technology for quick, easy camber adjustments for track tuning.